In the arena of conventional wisdom much has been said and written on how to go from good to great as a leader. While much has been penned about how to get to the top it is important to understand how leaders stay there. John Maxwell said, “Great people have little use for fame or notoriety; they are consumed with productivity, not image. They are content when the moment calls for them to be little, ordinary, or common – as long as the goal is achieved.” While many look to unlock the deep secrets and mysteries of leadership; is it possible to overlook simple characteristics that propel leaders to the top and keep them there? I believe it is, and here are a few observations on how great leaders do it. Great leaders are comfortable in their own skin; they are authentic. Authentic leadership has a vested interest in the lives and well-being of others. In the life of your organization and the credibility of your leadership style, is there anything more important? Dale Carnegie said, “You can make more friends in two months by becoming interested in other people than you can in two years by trying to get other people interested in you.” This is at the heart of leaders who make it to the top. Hang around any great leader long enough and you will soon find that you feel right at home around them. Why? When the leader is at ease others around him will be also and productivity will flourish. Great leaders have nothing to prove and care deeply for those near them. Great leaders are content to ride shotgun; they delegate. By and large, great leaders did not get to where they are by going it alone. Neither will they remain there without being surrounded by a devoted group of leaders with a shared vision. Jim Collins said, “The moment you feel the need to tightly manage someone, you’ve made a hiring mistake. The best people don’t need to be managed. Guided, taught, led – yes. But not tightly managed.” A great leader is great because he gives adequate space to those around him to achieve their full potential. Great leaders understand the greater purpose of riding shotgun. The leader understands that he will not sit atop his perch forever. Success calls for a successor and riding shotgun is merely driver training for a seamless transition. Leaders delegate for the greater good. Great leaders are careful to share the limelight; they are humble. All that matters to the leader is that the goals are achieved. Robert Woodruff said, “There is no limit to what a man can do or how far he can go if he doesn’t mind who gets the credit.” If achieving goals requires the leader to be little, ordinary, or common, then look for the leader to step up for the greater good. A great leader demonstrates strength in allowing the light to shine on others. For in understanding the big picture he accurately understands his small role. Great leaders stay on top not by acts of vanity but rather by acts of mercy. 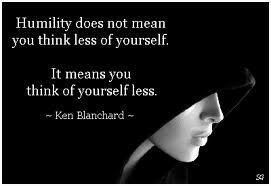 Great leaders dare to be authentic, delegate responsibility, and walk in humility. The secret to understanding how great leaders stay on top is found in the discovery that these were the habits formed from the beginning and have been practiced ever since. There are some great one-liners in this article..Yes, Great leaders are ones who are humble and I saw a notice board couple of weeks back that said "Himility is the key for success"
You have covered most aspects of the leader besides 2 essential ingredients...Good leaders provide direction , structure and they dont do different things but they do things differently. Also, I think most great leaders are great orators/communicators...Not only do they think differently, they are able to articulate their thoughts lucidly and can goad people into action by merely talking.